Edda: Cute interpretation of tomato or strawberry. I went to Vince's school to tell them about Halloween, the holiday is getting more popular here, but mainly it's just celebrated in the American neighborhoods (the opposite of Chinatown in the US) which is decidedly not where we live. 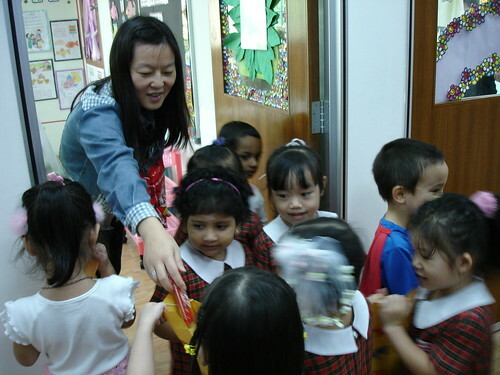 The Chinese teacher was particularly interested in it, but it was pretty much impossible for me to explain (in Chinese) pagan holidays and All Saints Day, so I left it at children getting free candy. Also, how to explain "trick or treat"? Did I really want to say that if you don't have treats, your house gets TPed or egged - it puts Americans in a weird light. 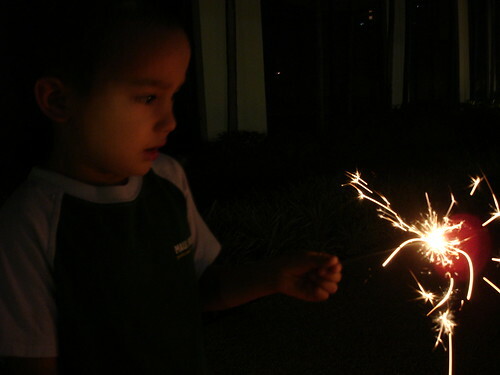 But who knows, in Singapore, it perfectly fine to give sparklers and small firecrackers to a 4 year old. Anyhow, I made the teachers go to different rooms in the school and then the kids and I went trick or treating. The love of getting free candy apparently crosses cultural boundaries without too much trouble. To going balls out crazy and buying a digital SLR... Tell me I'm crazy Doris. Tell me I don't need to do this... I'm just pissed sometimes that my P&S photos come out all blurry when the AF misses... sigh. Halloween - here we come! Halloween begins in our house with baking. I tried to find orange sprinkles to make my sugar cookies into sparkly orange pumpkins - but it wasn't at the local market - so orange glazed with rainbow sprinkles will have to do. Oh, also, our 4.5 year old computer which we use as a TV/DVD and internet portal for the kids seemed to have reached the end of its rope today. I couldn't get it to boot up, no matter how much I tried. Vince was OK with it, but Edda, she looked at me with sad eyes and whined for her videos for most of the afternoon. Jeremy's eyes were all aglow with the possibility of purchasing both a new computer and gasp, maybe a TV and DVD player. But a few minutes of computer genius and dumb luck (unplug everything and then plug everything back in) and the old clunker sputtered back to life. I was really sure that this entry was going to be Grumpiness: Part 3, but luckily, the weekend has ended cheerfully. 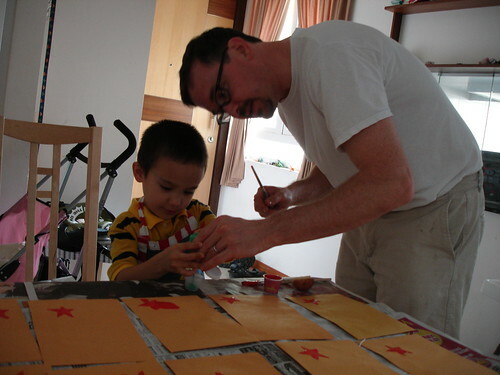 Jeremy even attempted the potato and paint craft again with Vincent to prove that the cheerful Jeremy was back. No one ended up frustrated and we had a bunch of decorated trick or treat bags in the end. Wow, what a grumpy day - it seemed nice enough when we started, but it pretty much went downhill from breakfast. Jeremy didn't get enough sleep (not because of Edda, just because he was preoccupied with work stuff), then Vince refused to eat breakfast, then Edda hated being at the dog park. Then the afternoon started, the gymnastics class went OK, but the ride home was a sea of grumpiness and tired complaints and then the afternoon went downhill with a failed paint and potato art project and a 2 hour stew that was started at 6 pm. Then Edda refused to go to sleep until 10:00 pm which means no alone time for me and Jeremy because we are totally beat. Goodnight! I'm going to bed. Tonight I'm in a funk. You know it's that feeling you get when one of your not-so-close friends, but better-than-aquaintence friends spends $400 to get 3rd row tickets to the sold out Elton John concert with his new girlfriend and he runs to the lunch room all excited and tells everyone about how cool it's going to be and even though you never really liked Elton John (a bit cheezy and what's with the weird costumes? ), it seems as if he's having more fun than you sitting at home eating cold pizza and watching TiVoed episodes of Project Runway with some great friends who are bringing cold beers and you know you are going to laugh until it comes out your nose. I know, it just doesn't make any sense, because, really what is better than beer coming out of your nose? can turn grey skies blue! 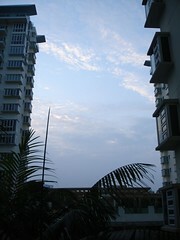 Finally the rains have come - the haze has been washed away, and I awoke to clear blue skies! Hooray! Edda enjoyed the morning sunshine through her window as she tried to wack Vincent awake with her armbrace. Get out of the way of that brace, it's a loaded weapon! Today, Vince started gymnastics at Sporty Joe's. He loved every moment of it, the uneven bars, the vault (it's hilarious watching 2 year-olds try to vault), the trampoline, etc. 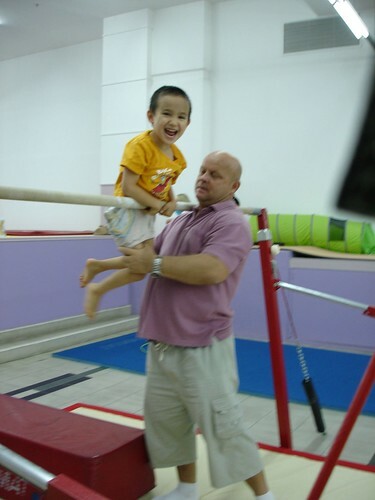 Vince is now signed up for 3 classes: swimming, music and gymnastics and he loves them all. Before each class, he revvs himself up with so much excitement, you can almost see sparks fly from his head. It is with some feeling of defeat when I realize that this is the solution I have come up with for entertaining my children. 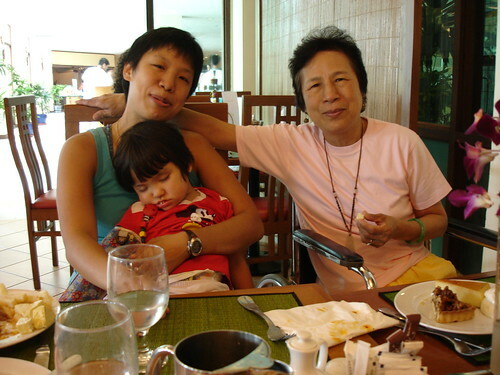 I had a vision when I moved to Singapore that the kids would spend the mornings in school and in the afternoons, we would find friends and go to the park, zoo or pool with them and I wouldn't sign up for any scheduled activity. The weather is great, you can always be outside and there are plenty of things to do. But first, we had trouble meeting friends - everyone else was signed up for stuff or waaayyy to busy to hang out, or maybe I'm just lame and can't get past the hi in the hallway phase. And now, with all of Edda's therapy appointments, we barely have any free time to just hang. And I started to feel bad that Vince just got schlepped to all these appointments and he had to make do with the toys in the waiting room. He was so excited that the gymnastics class was for him and not Edda. 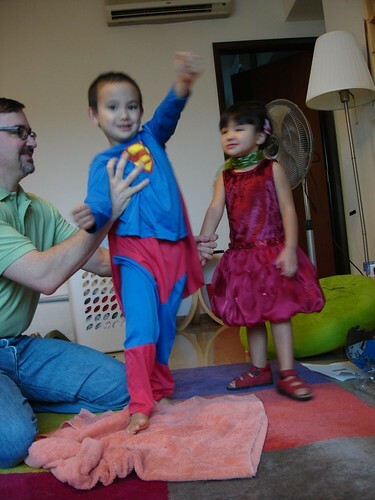 He calls it his own physical therapy class and he said that he would teach Edda everything. 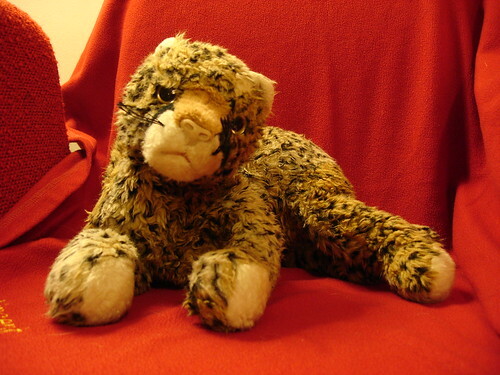 Edda had her own turn sitting in the waiting area - when she realized the class wasn't for her, she was pissed. Cried and thrashed around. It took at good 15 minutes to calm her down. I've been pushing the boundaries of my camera recently. I like taking close-up photos of moving people in low indoor lighting and no flash and as a result, all my pictures are blurry. Jeremy's been looking at cameras again, but I don't think I'm replacing mine, even though I've had it a year and it is no longer sold, I think of it as being new. Argh, I wish I was a better photographer. Yes. I finally was able to drive to work today. Actually as it turns out, I was able to drive to work yesterday, except I didn't get the memo from my muslim friends. Sigh. So today, I did a lot of things I couldn't do with a car - I went thru the drive thru at In-n-Out Burger, I went shopping at Macy's in Stanford Shopping Mall, I got a Chai Latte from Starbucks, and browsed a bit at Best Buy. Everyone is back at work and school. Hooray! One of the best part about going on vacation is to come back to your regular routine. Genesis had a celebration for the holidays this past weekend, Edda went all dressed up. Also, Jeremy and I swear that Edda was trying to say the word "more" at dinner. 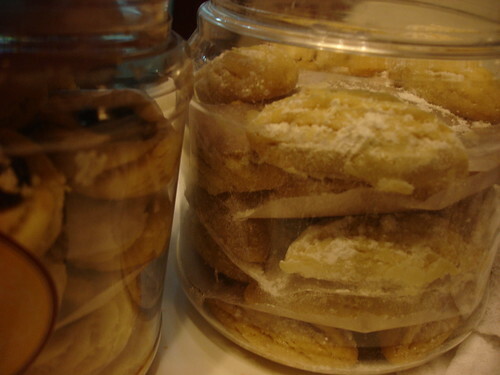 Today is Hari Raya, the end of Ramadan, a public holiday in Singapore. So Donald, I suppose you are driving your car again after weeks of pedal power. We went to a playdate today where we met an eye surgeon! Woo hoo, we peppered him with questions about Lasik - Jeremy's still thinking about getting it done. But both Mr. EyeSurgeon and Mrs. EyeSurgeon wore spectacles (aka glasses for the non-British / non-Singaporean). Hmmm, might that be a clue? Mr. EyeSurgeon (a 38 yo man) said he didn't get Lasik because he felt he would need reading glasses soon anyway and since all his work involves close work it wouldn't help him avoid glasses. Dakshi also came over for a delicious fajita dinner. Dave and Xiaoli flew in from Toronto and we all had a whirlwind of activites. Of course, this mostly revolved around eating and hanging out with married folks. Ha. Speaking of weight, I gained like 4 lbs this weekend simply cause of the food. I had been doing pretty good cutting back food before that. Sigh. They came Thursday night, and we stayed up till midnight. Friday we stayed up until 1. Saturday was the killer as everyone stayed up till 6. I was a little beat on Saturday cause I had to bike home Friday night, got like 5 hours of sleep, biked to the shop, biked home, and then biked back the Shwe and Xin's place. So I probably put in 80 miles roughly on Saturday alone, topping that off with low sleep. I woke up Sunday and just knew I was in a grumpy, anti social mood. Basically it lasted the whole day. I just really needed some chill out time alone, but I couldn't quite ditch everyone, so yeah. It was bad. Everyone noticed, but whatever. I'm working from home today. Thank god. I've gained 5 pounds since I started taking antidepressants. I chalk it up to feeling better and then I eat more delicious food - so the weight gain is a good sign of my mental state, bad sign for the waistline. My pants are starting to feel a bit tight and even though I walk a lot, I don't really bring my heartrate up very high to improve my aerobic ability, so I've changed my daily dog walk into my daily dog run. I hope this will enable my pants to fit again. Ruby seems to enjoy picking up the pace a little as well. About halfway through our first run, she licked me on the knee as if to say, "Yah! We are running again - you go girl!" Last Sunday, we were at LA airport waiting the plane to get back to Atlanta. The flight we booked was behind schedule. Daddy went to McDonald's to buy two burgers, one for me and one for him. He ate it at the airport. 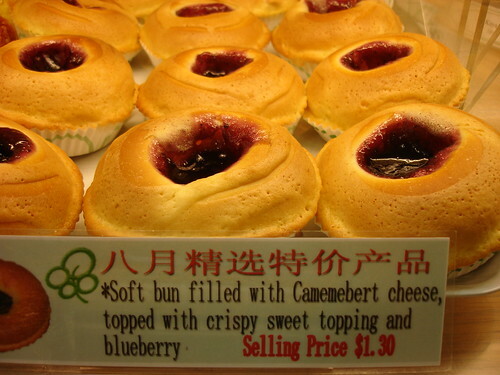 I brought it on the plane and ate it when flight attendant was serving drink. Later Daddy complained about his stomach and went bathroom few times. Aunt Margaret and Uncle Joseph left LA on Monday. It was quite surprise to me that they had McDonald's too. Just like us, Aunt Margaret ate her burger at airport and Uncle Joseph ate his burger on plane. The funny thing was that Aunt Margaret had stomach problem also. Uncle Joseph and I did not have any problem. I guessed that McDonald's at LA airport was not for any Lee. Both Lees are doing all right now. 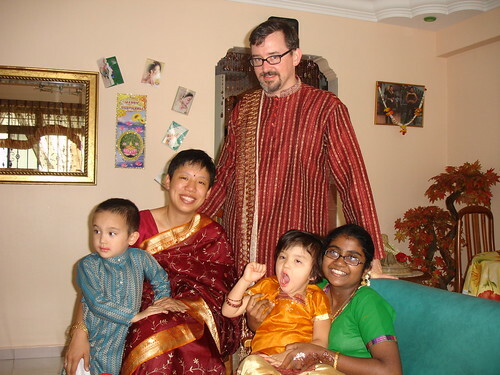 We went to Gowri's house today to celebrate Deepavali. I got to wear the beautiful sari that I bought yesterday. Gowri spent more time wrapping the sari around me than it took me to get ready for my own wedding. I actually felt more dressed up today than at my own wedding. It was all so beautiful and I felt so fancy. I hope I can remember how to tie the thing together. Gowri cooked wonderful dishes for us to eat - chicken sambal and mutton curry. Yum-o! We were more dressed up than anyone else I saw walking around today. It is my first time to use wheelchairs and crutches. It is quite an experience. First, with a hurting foot is much worse than with a hurting hand. Of course, hurting of anything is no good. Last time, with a broken wrist, I could still go around and cooked some food with one hand. This time, I can not go anywhere. But, accidents do happen. I never realized that the feet are so important to everyone. They provide strength and freedom. With pain in my foot, doing small things such as changes clothes is a big challenge. Normally, I can change my clothes with no time and at any position. Right now, I have to sit on a chair or bed to do it. On the good side, I am getting many helps and enjoying the immobility of laziness which forces me to sit down most of the time. However, I had many perks too. When I was in Indonesia, Doris and Jeremy wheeled me around, even to get my food. With an injured foot, I still could go to pool and swam a few laps with kids and had great time. When I went to any airport, the wheelchair services were very good everywhere. My plane was delayed in Tokyo, the ticket clerk immediately helped me to re-route to SF, St Paul and to Charlotte, instead of Detroit to Columbia, SC. She also helped me to send an e-mail to Noel. My seat assignments were also very good. My seats were just behind the business class with larger leg room in most cases. When we came back to Atlanta from LA last weekend, plane was off schedule for more than 5 hrs. That meant, I will arrive home around 5:00 AM in the morning. But, I was able to get an earlier flight home because the crutches. So, it was not all that bad with an injured foot. In Hong Kong, big brother and sister treated me so well. They even booked a special licensed van to pick us up in front of their house and straight to Shenzhen, China without changing driver and not through the regular customs. We directly passed through a special window with no lines. At their home, one of their maids knows how to massage my foot. She used ginger to massage the foot for two hours everyday. After two days, my bruises were gone. She was very happy. I was happy too. I was very lucky this time, I did not break any bones. Looking back, I did made some mistakes. The major one was I did not wear any socks and shoes. I learned a hard lesson this time. Socks and shoes are good for protecting our feet. Nothing could happen if I had my socks and Reebok on. In addition to use wheelchair and crutches first time in this trip, I also experienced my first facial massage together with Doris at Baton Resort in Indonesia. It was quite an experience and they deep cleaned you face, especially the nose. It was also a very enjoyable to have my feet massage first time in Shenzhen with Big Sister too. I enjoyed being with Vince, Edda, Doris and Jeremy. Especially seeing Edda’s mobility is improving every day. Now I am almost back on my own feet and understanding more about the wheelchairs and crutches. Our aircons are officially kaput - nothing wrong with the house circuitry, the aircons are shorted, nothing to do about it now (friday night - 10 pm). Sigh, so we are heading into this 4 day weekend without aircon in our main room. I hope the ones in the bedroom can keep on truckin'. The 4 day weekend is to celebrate Deepavali and Hari Raya. 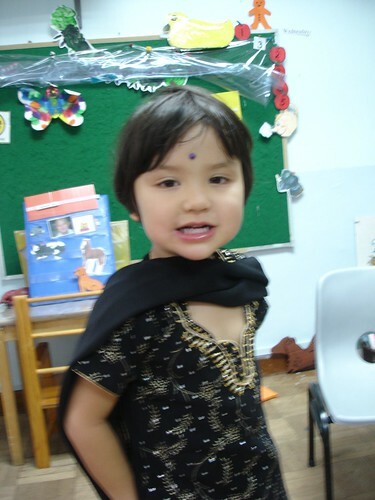 Our babysitter Gowri and her daughter Vino took me down to Little India today to buy a sari for me! I also got outfits for the rest of the family. Tomorrow we are going to their house to eat and eat. Here they are buying some sweets. 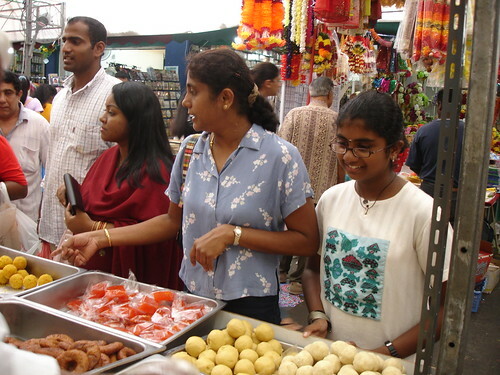 Little India was crowded and bustling with holiday cheer - the sari shop had mountains of beautiful fabrics strewn and the food markets were crammed. 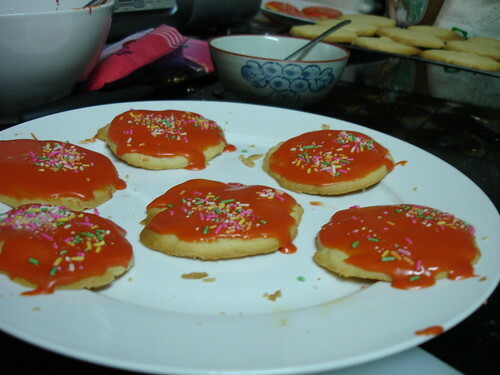 Rukia, who is Muslim, gave us these traditional Malay cookies that she made herself. Yummy! Well, Tahera, Arif's wife, found out that her father has cancer, and it doesn't sound very good as it is in the bone and the lungs. They are flying off to London tomorrow to visit him. He's had colon cancer before and has gotten thru that, but dunno if he'll be able to do it again. Tahera and Arif seem to be handling it pretty well - hopeful, yet realistic. I know everyone in the States is luxuriating in autumn weather. Cool breezes, leaves falling off trees, apples, sweaters, light jackets - all things that I love, but here in Singapore we are still running our aircons 24/7. Especially now since the air quality is pretty poor. Our dining room/living room/family room/main room area is cooled by 2 aircon units on one fuse. I don't know what's wrong with them, but it not only flipped the fuse on the circuit, but it also tripped the main circuit for the house and the circuit in the main electrical riser right outside our front door. So since I like power in our house, we left the circuit for the 2 workhorse aircons off which means I'm using the bedroom aircons to cool the main part of the house. Also the aircons appear to be leaking behind a wall somewhere, so I'm a bit freaked this whole thing is going to be a major wall ripping/air con replacing/ electrical shorting kind of project - not that we'll have to take care of it, there are landlords and agents helping us (thanks Lin) - it's just going to be something messy and dusty and loud to live through. Does it look like chicken ham? 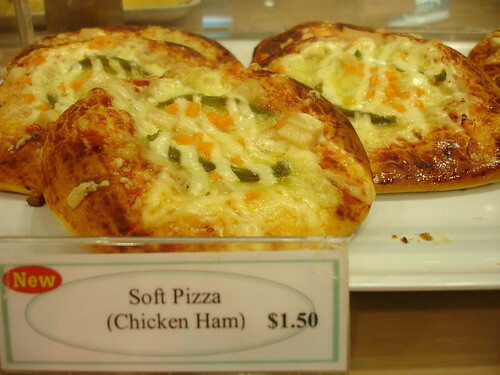 More like green peppers and carrots on a cheese danish. Vince is bouncing off the walls. He has extra energy to burn and I'm not very good at providing a physical outlet for it all. Grrr... soccer mom, here I come, I can see that black and white ball coming straight towards me. I already have the van. 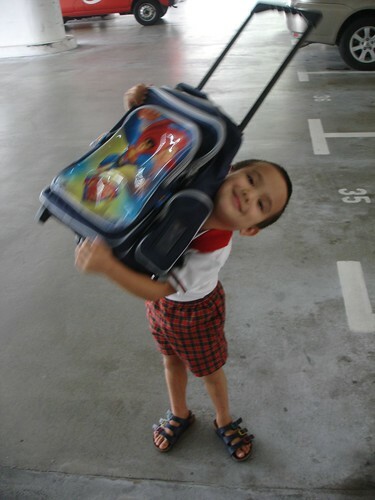 Vince insisted on getting this Superman backpack. It is huge. Such a pain to get it in and out of the car - but Vince loooovvveess it. Nothing much is happening around here, so I'm just writing a knitting update. 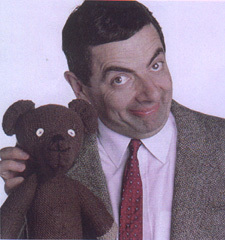 Apparently, Mr. Bean has a teddy bear with a floppy head. He's my next knitting project although he's not going to be brown and he'd not going to be very big. Crazy Aunt Purl is a semi-famous knitblogger. I got this from her. * Front Desk worker for a dorm. * As a process engineer, made photomasks, disk drives, and the orange strip of plastic that you see on inkjet printer cartridges. * I do love a good meal at McDonald's. * I'm pretty happy here in my house with the kids asleep and Jeremy and I are simulsurfing. * Would love to be hiking somewhere beautiful. * With good friends eating a good meal and laughing! * Oh yeah, and you - the one staring at the computer screen! Oh yeah, Uncle Robert smokes, is diabetic, is overweight, and doesn't exercise. I didn't know that either. Cassandra pretty much chewed him out about that. That's about all I can remember at this point. Also, Mom is too hip, as now she has a lanyard for her iPod Nano. It's been over a year since my secret pal 6, Sneaksleep gave me a beautiful skein of sock yarn. I can't believe it has taken me a whole year to knit a pair of socks. I started knitting pretty much a day after I got the yarn in the mail. I started with the standard cuff-down style sock and then after I was halfway done with the 2nd sock, I realized that I did the gusset wrong on the first sock. Should I rip the first sock back or do the 2nd sock in the same incorrect way? I wanted perfectly knit socks, so I ripped back both the first and second sock. (Why the 2nd sock? I have no idea, I can't remember.) 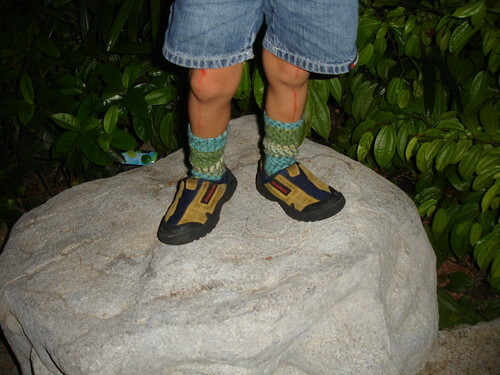 Anyways, I finally knit a pair for the V-man using the toe-up method. And no, they aren't perfect either, but this time I just said SCREW PERFECTION and kept knitting. Vince loves them but, of course, has no need for them as none of us wear any socks in Singapore (except for Jeremy when he goes to work). So much for practical gifts. Yes, I know he has his shoes on the wrong foot. This pair of socks also counts for my Socktoberfest entry! Woo hoo! Finally, Granpa is with Grandmom, side by side. That day, the sky was very clear. We even could see downtown of LA from the hilltop where Grandpa and Grandmom rest. After the funeral, the family's discussions about how to ... involving 8 siblings went extremely well. That was very good. I was very pleased to say the least. We are heading back to Aiken, SC this afternoon. We would appreciate any donations on Edda's behalf to the International Rett Syndrome Association (IRSA) or to the Rett Syndrome Research Foundation (RSRF). Take a look at both web sites find out more information about Rett Syndrome, new research results and fundraising events. Well, I'm in LA now. I thought Doris would enjoy this, as we are going to eat tomorrow morning at the Hometown Buffet - one of Grandpa's favorite places to eat! I've decided that my bad mood and slight headache that I've been having for weeks is due to the haze. Look how crappy Singapore looks. Ack! Where is the tropical paradise? It looks like downtown LA. But overally, I'm feeling much better now, the weekend is upon us - the kids are almost asleep and I spent the whole day out of the house! Well, okay. at least better if not groovy. Thursday nights are always a lot of fun for me. It's rock climbing night! While I'm not the greatest rock climber in the galaxy, I enjoy the physical and mental challenge of it. The usual crowd that goes is Arif, me, Mike and Ray. Mike is a funny guy and we like to trash talk each other - so that's a lot of fun. I like trying to see how the person who lays out the route, thought about what moves to make - kinda like how I like to think about the UI for electronic or interfaces for software - how the designer intended that device/software to be used, how that wall was supposed to be climbed. We got caught on this one wall tonight. Couldn't get up after 5 tries. There were like 6 people around us, all trying the wall out. I got to about six inches off the top. Oh well. Usually my forearms are toasted after climbing, but tonight, they are not too bad. I managed to bike home also. Now that's getting tiresome. Thank god I'm working from home tomorrow. I've been bummed for a few days as well. Grrr... Watch out. I actually told the kids to tread carefully around me today because my fuse was short. But everything that happened in the house today led to some sort of argument. I know I argue more when I'm down, but it just seemed like Edda was spilling more milk and Vince was covering more wall surfaces with marker than usual. Bleh! Argh! The crap fair has set up shop in front of our MRT station. Sorry, I left my phone at Arif's which is why you haven't been able to get in touch with me so far. I'm doing better, just sorta down. That's all. Monday night, Arif invited me over to break fast with him. Tahera had gone up to the city to watch The Killer's concert with Nasreen. It was good to chat with Arif and spend some quality guy time with him. He always has a pretty even keel view on life that's pretty refreshing. Anyways, biking is getting tiresome. I just got back from acting class. I'll write more about that later. Right now, I'm going to bed cause I gotta get up for a 10 o'clock meeting which means i have to get up by 7:45... sigh. 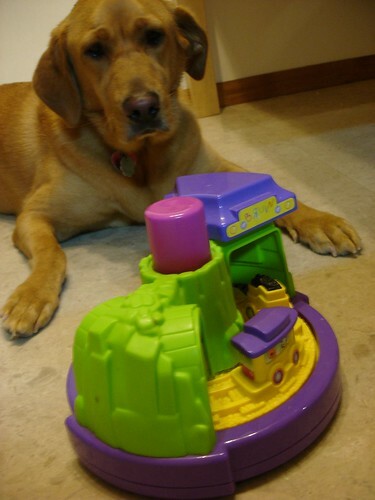 Do you see this toy? I hate this toy. Hate! Hate! Hate! I bought it at Toys R Us months ago, again feeling all sorry for myself. Edda was almost 2 when we bought it. What a pitiful shopping trip was. We were there to buy Edda toys that she could play with - slowly realizing that she couldn't play with any toys, even the baby infant toys. Her favorite thing to do was to chew that disguisting Peter Rabbit of hers. So I bought this toy and I put it down in front of Edda and tried for a long time to get her to push the damn button so the train would go around. She didn't really get it. It was a difficult time, I wasn't even really sure that she recognized who I was. Did she know that I was her mother? I'm happy to say that we are done with this toy now, it is going to the Salvation Army. Edda knows how to push the damn button to make the train go around. And it didn't take her nearly as long as I thought it would to teach her. She did get it - she's getting lots of things now. They are such small steps for a typical child, but they are fantastic for Edda and I'm so happy for all of us that she's making this progress. I like all kinds of yarn! I have a nice little needle case. I have been knitting since Secret Pal 6, I learned by reading a book. I would say that I'm an advanced beginner. Yes! Reese's Peanut Butter cups! No other crafts. I have a spindle, but I haven't tried it out yet. I like music, but I'm stuck in the 90s. Any contemporay music that you can dance to would be appreciated. I can play any type of music. Keep the neon colors away from me, otherwise, I'm easy. I have a husband (Jeremy, 38), a son (Vincent, 4), a daughter (Edda, 2), a dog (Ruby, 5) and 3 fish (Zypher, Crash and Boom). 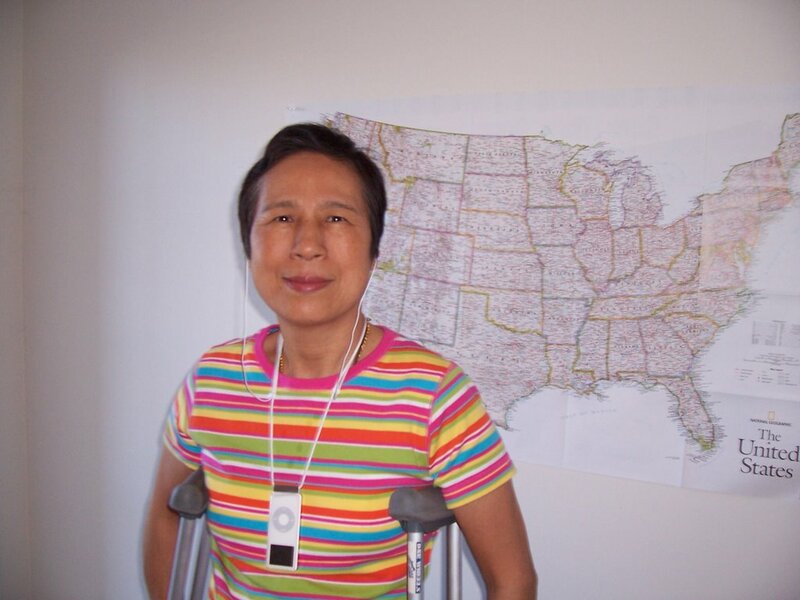 I'm ethnically Chinese, born in the US and living in Singapore. I am a stay-at-home mom. I used to be an engineer and I want to be a nurse. Plain old socks and a lace shawl. I like metal needles, but I'm not picky. Straight/circular depends on the project. I have a yarn winder. I have no UFOs. I like to keep at one or two projects until they are done. I don't have any subscriptions. I don't have very many knitting books, so almost everything is fair game. I'd love to learn color knitting. Yes, I have a size 8 foot. Yesterday was Joy and Phil's weddding day. Joy and I go way back to the first week of MIT. We've always been really good friends since I was her caretaker for freshman year. Everytime Joy had an accident or mishap - which was frequent - I was around to help her out. 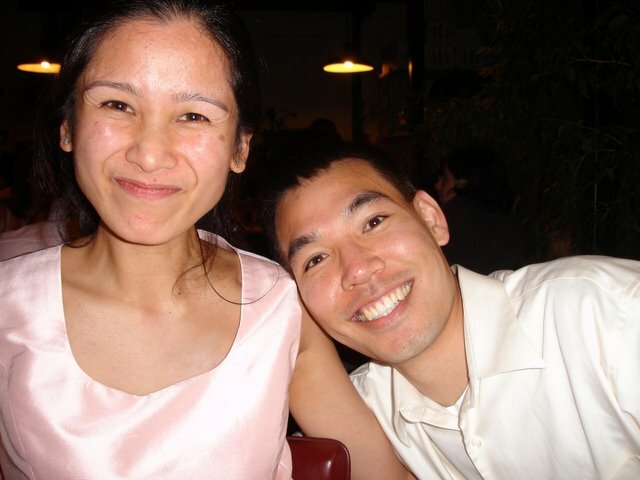 It all started Friday night as we went to Doris and Jeremy's favorite pennisula Thai restaurant - the Amarin Thai. They had an outdoor seating area in the rear to seat 50-60 people that I never knew of before. Of course, a whole bunch of friends from MIT came by to celebrate. Fenney and her fiance Sanh. Heidi and her fiance, Hiway, and another McCormick alum, Susan. I'm the closest to Fenney, who, very ironically lives in Bethesda now, and works as an OB/Gyn in Holy Cross hospital where I was born. Joy never liked any of her friends from separate groups mingling and sharing stories about her. So this was the first time that her college friends and her med school friends could gossip about her. Basically she was a total prude at MIT and went wild partying at Stanford. Laff. The wedding was at Stanford Memorial. Everything started on the dot like clockwork, cause, of course, there was another wedding party waiting in the wings. Joy had a crazy designer dress that would drag on the floor, so she had to take 2 steps and then kick her dress to get anywhere down the isle. She also wore the largest smile I've ever seen on her face as she came down with her father. The ceremony itself was okay. lots of god and singing, which i found ironic since neither of them are religious. but whatever. 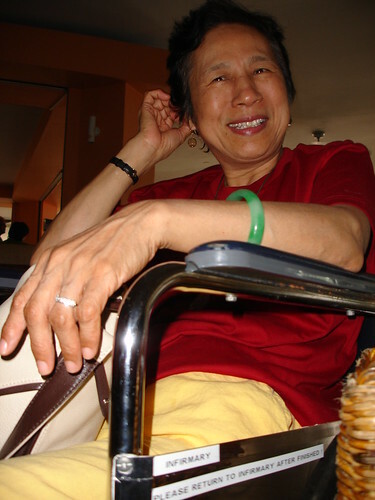 At about 1, we all went off to the Joy Luck Place in San Mateo for the banquet. It's probably the best meal I've had at the Joy Luck. There was this lobster dish with a garlic black bean sauce that was to die for. The highlight of the evening was Joy and Phil's two costume changes. One into traditional Korean garb (he's Korean) and another time into tradition thai garb (joy is Thai). Amazing really. I'll try to dig up some photos. Ruby misses Trudi. 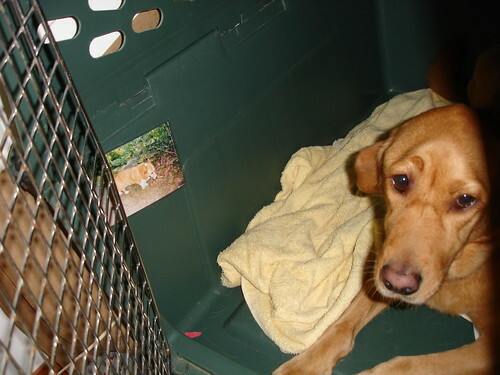 So I put a picture of Trudi up in Ruby's crate so she can see her friend before she goes to sleep at night. Today we went to the dog park and there was a 5 month old corgi who loved Vince! They chased each other around and around. So cute! 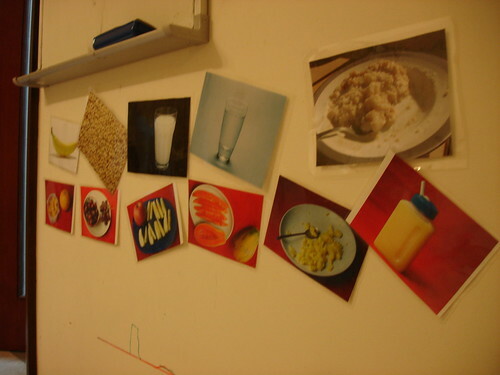 Pictures of food on the wall. Our dining room wall is getting filled with laminated photos of Edda's favorite foods. Edda is starting to use these cards to tell us what she wants to eat. My main memories of my grandfather are so blurry and fuzzy. We spent only a few weeks together during my whole life. I think maybe twice in my life, I flew from DC to California to spend a week with my grandparents. I remember he loved Whoppers, we walked to the Burger King everyday for lunch. I remember he and grandma ate crackers and jelly for breakfast. I remember he took me to the San Diego Zoo and Sea World - I don't actually remember the zoo or the amusement park, I just remember how long the bus ride seemed to be from LA to San Diego. I remember he had a scruffy cat and he was the first person I knew who had a sprinkler system in his front yard. I know that he was not an easy man to live with, but he was kind to me during our short stays together and it was nice. I'm trying to find photos of my grandfather (my father's father), I think there are a few digital ones which show him hanging out with Vince and Edda, but they are lost in a sea of disorganization. I know I have paper ones, but those are locked in a storage facility somewhere in New Jersey. 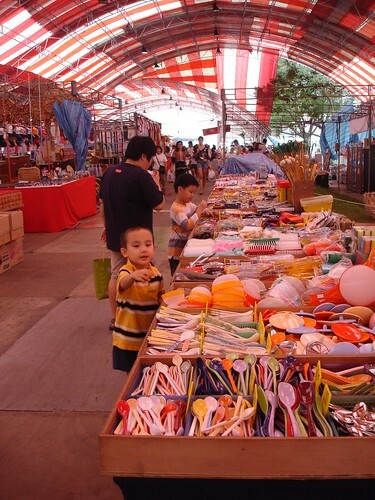 Vince is sick today - he stayed home from school, but not sick enough to participate in today's Mid Autumn festival. Grandpa passed away in LA at 96 this morning. In LA, aunts Diana, Jane, Liz, Helen and uncle Joseph took care of him day in and day out for all these years for which I am deeply appreciated. Although Grandpa was healthy until the last moment, still there were a lot compassion and hard work involved. Well, finally, Grandpa and Grandmom can rest together and I wish them all the best. About 6 to 8 months ago, when I was in the middle of all this medical crap for Edda, I couldn't look at other children Edda's age or younger without feeling sorry for myself. A tightness would surround my chest and I would have to excuse myself so I could sit and cry in the bathroom. There were plenty of dinners and parties where I had spent a good 30 minutes of the evening crying in the bathroom and then trying to make myself look like I wasn't crying. I would see 12 month old kids learning to walk and using their pincer grip and when they would reach out to say hello to me, I would give them the evil eye and mutter to them something about not knowing how lucky they were to be able to pick up their own Cheerios. Grrr.. I didn't know if I'd ever be able to invite another child born in the year 2004 over to my house ever again. But I'm happy to say that I'm pretty much over it. Where I was 6 months ago, I was at the fork in the road and I could still see that most everyone else was taking the other road, which was well paved and had good directions and my road looked rather dark and in need of a good weedwacker. I really, really wanted to be on the other road, everyone else was turning right! I wanted to be in the right lane too! But now I'm so far down my own road, I can't even really believe there exists another road for me and my life for it is so far away now that there is no way I can find it again. So now I pick up babies and kiss them and tell their mothers how beautiful their kids are and I see the kids in Vince's school that are Edda's age and I'm OK with it all! There are no photos of beaches or swimming pools. There are no photos of sand or sunscreen. Within an hour of us arriving at Bintan, a mishap occurred. Vince, while jumping down steps, managed to unbalance Mom who was holding onto his little hand and Mom tumbled to the ground. The rest of the time at the resort, Mom hobbled around and we managed to snag the use of a wheelchair for the whole time that we were there. I was hoping that it was only sprained, but after 2 days of no decrease of pain, we decided to get the appendage X-rayed in Singapore. Everything is fine. Perhaps just a minor crack of the heelbone. Just a compression bandage and some Tylenol and Motrin and some crutches. We did have a good time. Mom and I squeezed in a facial at the spa and some good swimming sessions. Jeremy recovered from hives. 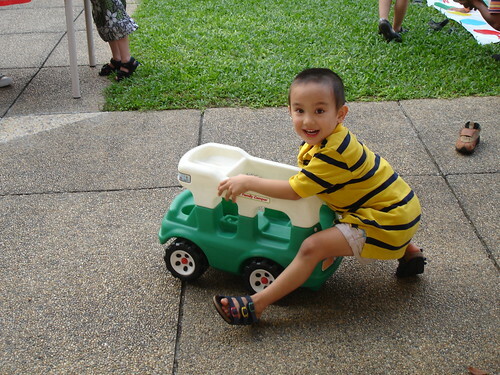 Vince took some time getting used to spending time in the Mini Club Med, but once he started he loved it. Edda had a nice time at the pool and the beach, but she still loves her air conditioning and if kept out too long in the tropical weather, she started to wilt. Mom is off in Hong Kong, not missing a step in her Asia tour!